Celebrating the life of Nick Alton Catoe, Sr.
Be the first to share your favorite memory, photo or story of Nick. This memorial page is dedicated for family, friends and future generations to celebrate the life of their loved one. 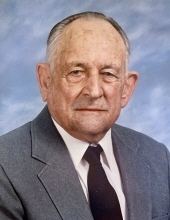 Obituary for Nick Alton Catoe, Sr.
Funeral services for Nick Catoe age 96, will be held 11 A.M., Monday, March 18, 2019 at Madisonville Funeral Home in Madisonville, Texas. Rev. Dean Ferguson will officiate the service. Interment will follow in Allphin Cemetery in rural Madison County. The family will receive friends Sunday, March 17th from 6 P.M. to 7:30 P.M. at the funeral home. Nick Alton Catoe, Sr. was born March 14, 1922 in Midway, Texas to Nick Alexander & Mary Ella (Pearson) Catoe. He moved to Houston in 1939 and lived there briefly before he was drafted into the U.S. Army where he served in the South Pacific and Phillipines. Following his honorable departure from the Army, Nick came home and married Dorothy "Lorene" Grisham on March 23, 1946. They made their home in Houston and Nick worked as a carpenter with his father in their business, Catoe and Catoe. Nick then worked thirty-three years for Sinclair Oil Refinery which later became ARCO. Following retirement, Nick moved to Madison County where he and Lorene built a new home. He passed away March 13, 2019 at his home just hours shy of his ninety-seventh birthday. Nick was preceded in death by both of his parents; first wife, Lorene Catoe (March 28, 2001), three brothers and three sisters. He is survived by wife, Jean Turpin Catoe of Madisonville; son, Nick Alton Catoe (Maria) of Bulverde; daughter, Cathy Catoe Elliott (Rick) of Forney grandchildren, Aaron, Marissa, Mariella, Tiffany and Josh, as well as, four great grandchildren. To send flowers or a remembrance gift to the family of Nick Alton Catoe, Sr., please visit our Tribute Store. "Email Address" would like to share the life celebration of Nick Alton Catoe, Sr.. Click on the "link" to go to share a favorite memory or leave a condolence message for the family.